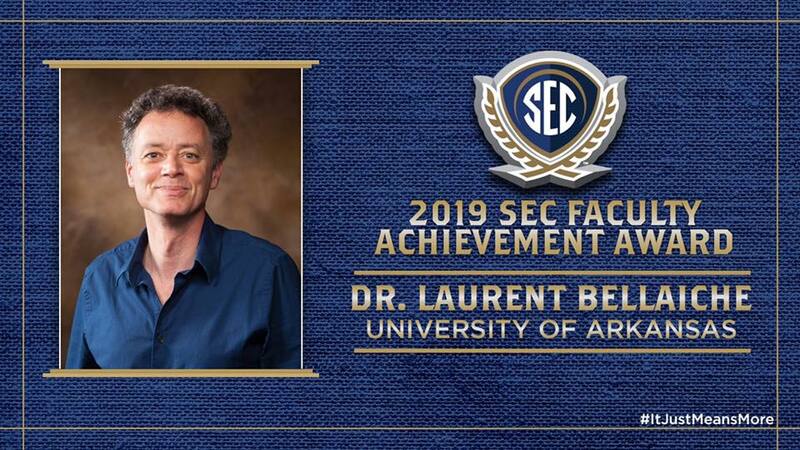 J. William Fulbright College of Arts and Sciences physicist Laurent Bellaiche has been named a winner of a 2019 SEC Faculty Achievement Award. These awards honor one faculty member from each SEC university who has a record of extraordinary teaching and nationally recognized scholarship. Bellaiche uses modern computational and simulation methods to study ferroelectrics, semiconductors, magnetic compounds and two-dimensional systems. His research contributes to the fundamental understanding needed for progress in applied fields such as semiconductor technology, piezoelectric devices, and material science. 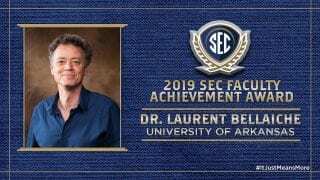 In addition to his role as a Distinguished Professor in the Department of Physics at the University of Arkansas, Bellaiche also serves as a visiting faculty professor at Ecole Centrale in Paris, at Xi’an Jiaotong University in China and at the Luxembourg Institute of Science and Technology. Bellaiche holds a doctorate from the University of Paris. He has published approximately 300 refereed articles in leading journals and delivered more than 200 invited presentations. He has secured nearly $45 million in grants and awards from a dozen agencies, including the National Science Foundation, the U.S. Department of Energy, the U.S. Department of Defense, and NATO. He has supervised approximately 60 students and post‐doctoral researchers. Bellaiche received the Ralph Powe Junior Faculty Enhancement Award from Oak Ridge Associated Universities in 1999, and a CAREER award from the National Science Foundation in 2000. He is a fellow of the American Physical Society and of the Arkansas Research Alliance.